There would be nothing new under the Middle Eastern sun, if it were not for the dramatic upheaval that triggered the birth of the Islamic State in Iraq and Syria. This continues to agitate the countries of the Coalition and those directly involved in the war, such as Turkey. The Assad government, through its Minister of Defence, recently said that two MiG fighters, while flying over the airspace of Syria near Kobane, have been shot down and fallen into the hands of the jihadists of al-Baghdadi. By itself, the news would not be significant, since Syria is the country being attacked by ISIS, if it were not for the government's attempt in Damascus to present itself as reliable ally of the Coalition, despite not being part of its "counter-terrorist" agenda. It is thus trying to deflect Western pressure. Meanwhile, the Syrian regime continues to buy the oil it needs on the black market from the IS dealers, the oil that was once its own and is now, for the most part, in the hands of its bitter opponent. Turkey meanwhile remains unmoved, with its army of tanks no more than a kilometre from Kobane, a city besieged by jihadi militias. It has agreed to allow Iraqi Kurds to pass through its territory, because they are fighting against the terrorism of the “Caliphate”. On the other hand, as its President Erdogan repeated, it will not allow its military bases to be used by the Coalition to fight more effectively against al Baghdadi’s militias. Meanwhile it allows the transit and sale of jihadist oil on its territory, in a kind of geostrategic schizophrenia, where the fight against terrorism and its energy disruption of the whole area, is combined with the economic imperatives of the various actors’ national strategies in this latest piece of bellicose barbarism. The Coalition is forced to start its fighter bombers from bases in Kuwait and Qatar, extending their flightpaths as well as the costs of the bombing. On the other hand the targets hit are predominantly those of the military posts of the Islamic State, but not "its" sixty or so oil wells in the occupied territories in Syria and Iraq. As is well known, the proceeds of the exploitation of the wells brings in a figure of two million dollars per day through IS doors, representing the real source of its financial and military strength. In the financial field it is estimated that it has "savings" of two billion dollars. On the military level, as well as what it stole from the routed Iraqi army, supplies come in from the normal international market which, as usual, certainly does not scorn the dollars of the "Black Caliph". Iran's new course is taking its first steps towards an agreement with the US that, if it produced results would lead to a reshuffling of alliances in the area, primarily between Riyadh and Washington, with all the consequences for energy supplies which have operated thus far. China and especially Russia are not too worried by the Islamic State, but are watching the behavior of Tehran to see that it does not compromise the Central Asian energy axis which, in Moscow and Beijing’s plans, needs Iran. Imperialist contradictions? Sure, but with an iron logic which is that nationalist interests in any given geopolitical and geo-economic framework have to submit to the laws of profit, oil revenues and control of means of marketing oil and gas, relative to the powers of the large and small players. At the beginning of this story, for different, and in some cases even opposing, reasons, the creation of the IS, the support granted and funding dished out were useful for Western and Middle Eastern imperialism to neuter some uncomfortable regimes, such as the Syrian government of Assad and the equally unreliable al-Maliki regime in Iraq. Then, when the monster they called up began to walk on its own legs, creating more disasters than benefits, compared to the expectations of these sorcerer's apprentices, the ally had become the enemy to be killed, but with a number of caveats where the special interests of each of the actors lay that each wanted to pursue individually. Therefore everyone is against the terrorism of the Islamic State, but watch out for oil wells that do not need, at least at the moment, to be destroyed. All are against al-Baghdadi, but without favouring his competitors. All work together, but not too closely, in order to leave room to pursue individual interests. 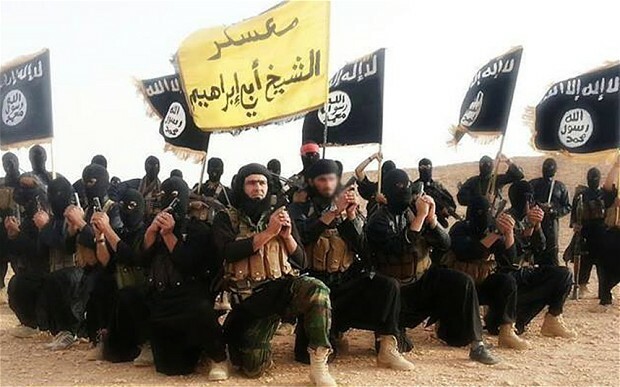 The Islamic State will fall, a new energy balance of power will be achieved according to the different specific gravities of the imperialist powers. Everyone will want to gain something. Those who will lose everything, as usual, will be the desperate, the dispossessed, the workers who are suffering from the weight of yet another barbaric imperialist war. In time of peace they are faced with poverty and exploitation, and in time of war, are recruited as "cannon fodder" in tow to the self-interest of “their” national bourgeoisie which, in turn, support one of the big imperialist powers. They are called to fight against a "terrorism" which others, for their own interests, have deliberately invented, or to defend the alleged "progressive" nature of democracies that are only of use to the bourgeoisie who administer them, or to rush to the defence of the oppressed peoples of those bourgeois and imperialist states whose governments are themselves part of, and participating in, the Coalition. But those oppressed by capitalism, by the barbarism of imperialism, should instead begin to create their class "coalition" against every one of capitalism’s flags of exploitation and oppression and their diverse interests, regardless of how they are dressed up.